The Trident was originally conceived as a drop-keeler though this version proved to be the least popular of the three on offer. Only about one in six are centreboarders. With their 230lb steel plate down they draw up to 5’9″ (1.75m). But with it raised they float in just 2’1″ of water. The ½” hot-dipped galvanised steel plate is raised and lowered by a stainless steel wire attached to a cockpit winch. The plate is housed in a GRP plate casing in the saloon. This minimises the leaks that can plague wooden centreboard cases. The 3/16″ pivot bolt of the plate passes through the 1,580lb cast iron ballast keel outside the boat so cannot give rise to leaks. 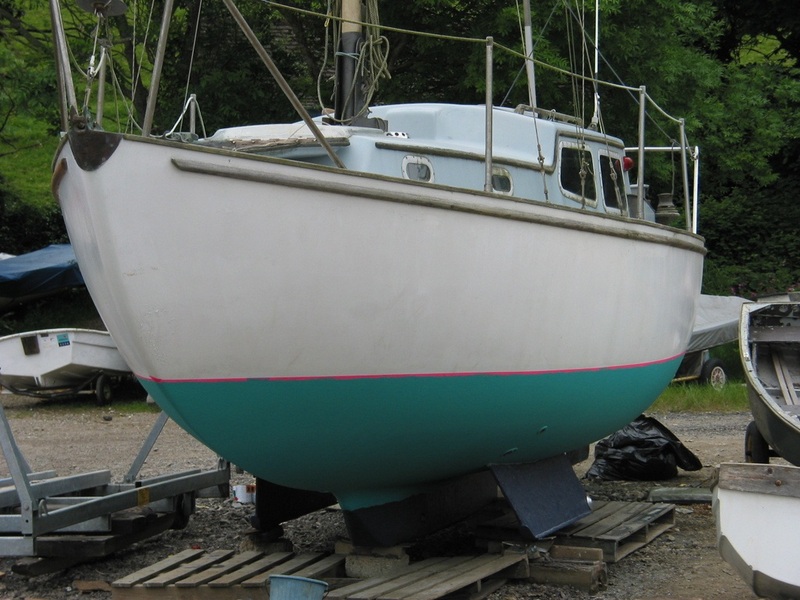 The 9 inch high ballast keel is attached with eight 5/8″ stainless steel keel bolts. 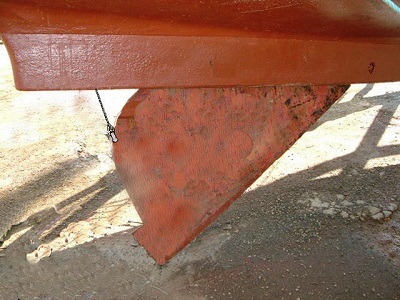 Centreboarders may also have the original a lifting steel rudder plate though Alan Hill also drew the dimensions for a shallow fixed alternative similar in shape to the triple keeler’s rudder. One or two centreboarders were built to order with short bilge keels to enable them to stay upright when aground (see right). Otherwise centreboarders may be fitted with short legs to remain upright when dried out. The centreboard winch appears to be mounted in various positions. No 1’s is mounted to port inside the saloon on the cockpit bulkhead. It is operated by a handle on the outside in the cockpit. A table can be mounted on the centreboard case in the saloon. 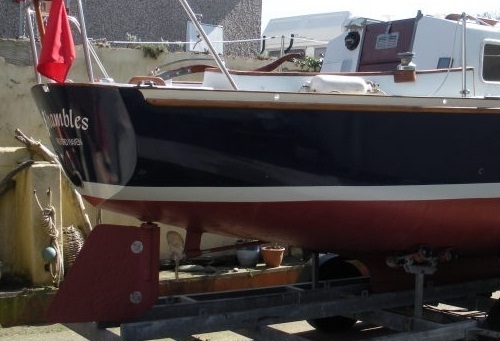 The original centreboard design showed a drop rudder but some later versions have a smaller fixed rudder. The designer Alan Hill provided dimensions for a shorter fixed rudder blade. The pivot bolts of the centreboard and the drop plate rudder need to be checked from time to time as they are subject to wear.